Yesterday I spent a day with my little ones. As we were getting ready... putting shoes on and grabbing my bags for a pool day, Satchi and Coco were running around the front yard... picking wild flowers that were just blooming. They each gave me one yellow flower and I tucked them in my notebook right away. Today I opened my Traveler's Notebook and the page still had the smell of sunshine and fresh cut flowers from yesterday. Instantly brought me the biggest smile. It's this tangibleness... that I know deep in my heart that any digital tools will not bring. It's the reason why we celebrate analogue process so much. 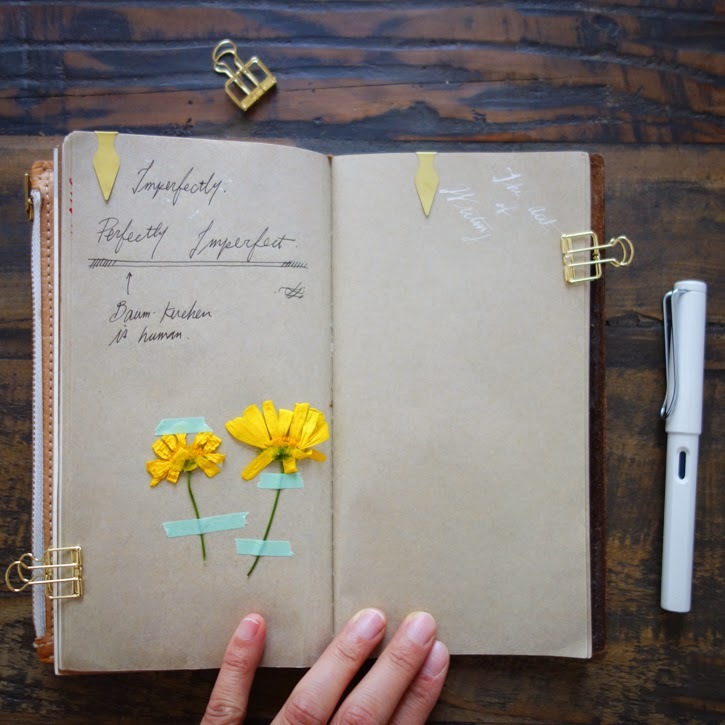 I am hoping that these flowers will slowly press in my Traveler's Notebook and I will remember the moment for a very long time. I also wanted to share my biggest gratitude for all the encouraging comments and emails I received after I shared my thoughts about Amazon sellers. Sometimes it feel isolating to be operating an online store because so much of what happens is virtual... yet getting to know each one of our customer through his or her stories always helps me feel more grounded and connected to the realness of what we do. So thank you so much for sharing the journey with us. I am hoping that we can always be very open and honest about how we make decisions at Baum-kuchen... and be able to stand behind them with 100% of our soul and heart.